In the aftermath of a relatively significant 2007 appellate court case, Illinois courts are increasingly unlikely to blue-pencil or modify overbroad non-compete agreements. That decision, Cambridge Engineering, Inc. v. Mercury Partners 90 BI, suggested that patently overbroad non-compete agreements cannot be reformed on the grounds that reformation would violate a fundamental public policy in Illinois. Since that decision, courts in Illinois have been hesitant to blue-pencil covenants to make them reasonable, and they appear willing to do so only when the blue-pencil remedy comports with the original intent of the contract. The most recent example of this involved a dispute in the business services printing industry. Andre Brazeau, a former Vice-President of Sales for Oce North America, left his employer to join InfoPrint, a joint venture of IBM Printing Systems and Ricoh. Brazeau's 2007 non-compete agreement prohibited him from becoming associated with any competing business anywhere in the United States. The court found that this restriction was overbroad under Illinois law and could not be modified under the blue-pencil rule. In particular, the court noted that while a nationwide covenant could be enforced, the contract normally must contain some other tempering limitation in the covenant. This normally is accomplished by defining precisely what activities - sales management, purchasing, recruiting - are off-limits. A blanket ban on employment with a competing enterprise, which is what Brazeau's contract provided, contains no such tempering limitation. In light of the Cambridge Engineering case, the court declined to modify the restriction. 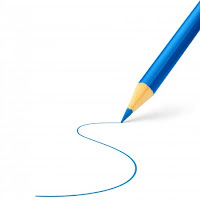 Employers in Illinois must be aware of courts' reluctance to deploy the blue-pencil remedy in cases where the original contract is worded far too broadly to meet the reasonableness standard. A close miss usually will enable the court to reform the contract, particularly in light of a clear breach or untoward conduct by a departing employee. But a big miss often times is not salvageable at all.